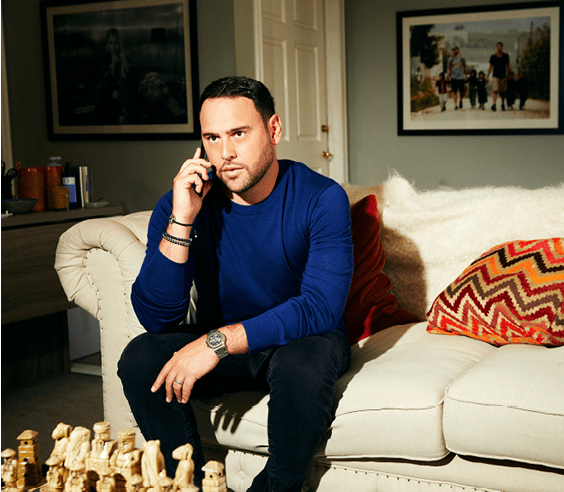 Scooter Braun was in a meeting with Lucian Grainge, the chairman and CEO of Universal Music Group, when an assistant broke in with news. There were reports on Twitter of a bomb at the Ariana Grande concert in Manchester, England. Braun, who at 36 manages Grande and a cadre of other pop megastars including Justin Bieber, Kanye West and Usher, asked his assistant to do some more research and get back to them. A minute or so later the same assistant came back in with more tweets, but there was still no official confirmation from authorities or news outlets. This was May 22, still early afternoon in Los Angeles, where Braun and Grainge were meeting. He and his team searched for news of what was happening at the concert thousands of miles away. Within minutes it was clear something terrible had occurred. Braun is typically laid back, the eternal cool guy. He wears shorts, tennis shoes and a baseball cap around his office and has no reservations about dropping an F-bomb or two, no matter who’s around. But when he talks about that day now, he grows a little quieter. “In my wildest dreams, I never thought that it could be what it was,” he says. Just after 10:30 p.m. local time, right after the concert ended, a suicide bomber waiting in the foyer of the Manchester Arena set off an explosive device packed with nuts and bolts, killing 22 people—a mix of children and parents waiting to pick up their kids—and injuring more than 100. At the time though, as Braun headed to the airport, details were still scant. Grande was crying uncontrollably. There were rumors, conflicting stories, utter chaos. Originally he was going to fly to London and meet Grande there. But when he talked to the police, they said they still didn’t know exactly what was going on, and he felt like it might be a better idea to get the pop star out of the country. Braun decided to meet Grande instead in Boca Raton, Florida, at her grandmother’s house. They spent the next two days holed up in that house, on edge. Braun was also getting details from the police and from the hospitals where victims were being treated. Grande didn’t want to continue her tour—she wasn’t sure she could ever sing those songs again—so Braun dealt with the tour cancellation insurance. He made sure the agents and promoters involved knew the shows weren’t happening. He arranged for counseling not just for Grande but for anyone on her staff. He was calling and thanking people for the way they’d handled things. As he made call after call, he found himself getting more and more upset. His first step was to get Grande on board. Initially she was hesitant. He admits now that it wasn’t fair to ask her to do it so soon. But by the time he landed back at Los Angeles, he had four text messages from her, and she wanted to talk. He didn’t make anything public until she’d had counseling and he was sure she could handle a return to the stage—in the same city where the attack happened. “Ariana is a tough Italian girl,” Braun says. “And when she gets this idea in her mind that she’s going to go after something, she’s gung-ho.” Even when she was feeling as enthusiastic about it as he was, he reminded her that she might not feel the same way tomorrow. That’s why he waited two weeks and didn’t announce the date until a week before the show, and why tickets didn’t go on sale until a few days after that. The next step was getting other acts. 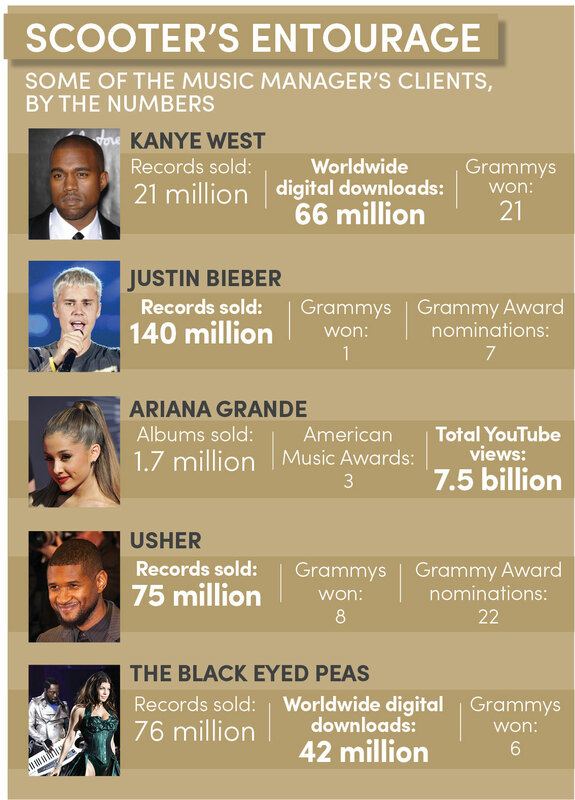 From there it snowballed and within 24 hours, he had commitments from a collection of the biggest names in pop music (some of whom he represents), including the Black Eyed Peas, Pharrell Williams, Niall Horan of One Direction, Liam Gallagher from Oasis and Marcus Mumford of Mumford and Sons. The artists all agreed to pay for their own transportation and do the show for free. Live Nation committed to sell the tickets without taking a profit, and the BBC agreed to broadcast the show live. The final step was getting a venue. The Manchester Arena was booked, and the nearby stadium and polo grounds would be occupied by a Manchester United charity soccer game—which, in Manchester, is sort of a big deal. But Braun would not be deterred. He called a former English Premier League player who happened to know the organizer of the game. Soon the soccer match, nine months in the making, was suddenly rescheduled for a concert that was thrown together in a matter of days. That’s the power of Scooter Braun. On the front door of the converted West Hollywood mansion Braun uses for an office is a small sign greeting everyone who enters. It says one word: BELIEVE. On the walls inside, there are photos and framed magazine covers and massive glossy posters of Bieber and Usher and Tori Kelly. (In hers, Kelly is pictured smiling next to the turquoise-hoodied elephant she voiced in the 2016 movie Sing.) In a second-floor courtyard, there’s a barbecue grill and pingpong table. And along a wall near Braun’s personal office is a display of hundreds of tiny Disney vinyl collectibles the company sent him after he took a guided tour of Disneyland and mentioned that he liked them. One wall next to his desk is covered with photos of Braun—who has a baby face and a close-cropped beard—with a mix of family and various celebrities: shaking hands with Magic Johnson, dancing onstage with Korean pop sensation Psy (another client), hugging Whoopi Goldberg. There are as many pictures of Bieber as anyone, and looking over all of the images, you can see him age from adolescent to full-grown man. Another wall is covered by massive shelves holding photos from philanthropy trips he’s taken with his brother, Adam, and dozens of trophies and awards his clients have received over the past decade. The staff at SB Projects, the company Braun founded in 2007, is young—nearly all of his more than 40 employees are under 30. There are bodies moving in every direction, people laughing and gathering for impromptu group conversations about basketball and new restaurants and the pros and cons of skinny jeans. On the day of my visit, Braun has an old friend from college visiting from out of town, and Braun’s wife, Yael Cohen Braun, comes to the office to say hi. He’s also taping promos for an upcoming talk he’s giving, and he and his staff are negotiating the details of a new Black Eyed Peas album and what sounds like some sort of TV contract for someone. On his desk is the book Sons of Abraham: A Candid Conversation about the Issues That Divide and Unite Jews and Muslims. At the moment though, he’s sitting on one of his oversize couches, scratching and fidgeting with his forearm. A few weeks earlier, for his 36th birthday, he got a tattoo: Hebrew signs for Life and Luck. He was told to keep it covered in the sun and avoid pools. This isn’t his first ink—he also has the word family in script on the inside of his left wrist. But still, a few days after he got it, he went swimming with his two young kids, with the fresh tattoo exposed to the sun for several hours. Now it’s red and cracking. He’s worried his arm is infected, and his staff is working on getting him an appointment sometime today with one of the top plastic surgeons in Beverly Hills—no small feat, even for the likes of Braun. Someone on his staff jokes that she’s disappointed to hear it’s so mild because she was looking forward to him having a hook for an arm. He laughs, smiles and rubs his arm. Braun is most famous for the talent he manages. 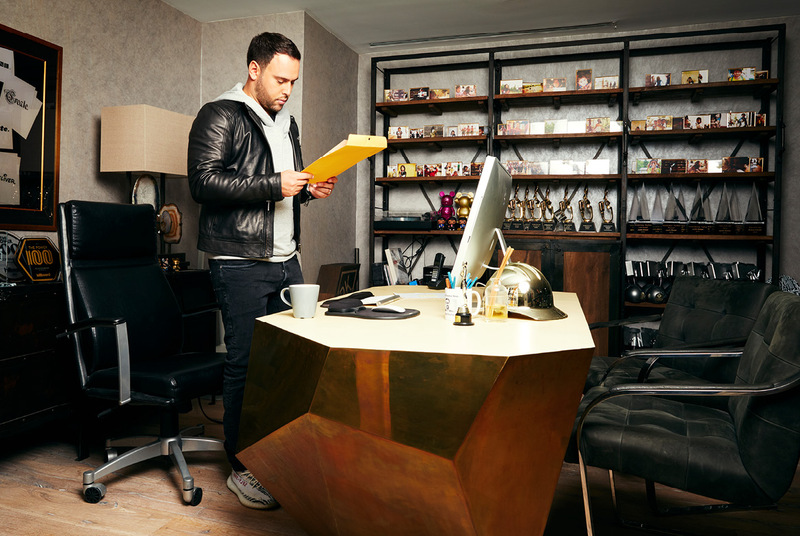 He plays a significant role in both Bieber documentaries, 2011’s Never Say Never and 2013’s Believe, and if one of his clients is in the news, it’s often him commenting. But SB Projects also produces TV and film, and handles all manner of social media. Braun was an early investor in both Uber and Spotify. It’s clear these days, though, that he’s thinking about something else, too. Something even bigger than entertainment and technology. “I don’t know if I’m going to be a manager forever,” he tells me. “I don’t know if I’m going to be producing films or television shows. I know that I have a job to do now, but I’m 36 years old and I know that I have a responsibility now more than ever.” He says our society is suffering from a lack of leadership. It sounds a little like he’s thinking about getting involved in politics. The avenue appears to be open: In August, reports surfaced that other California power brokers were urging him to run for governor. The story of how Braun found a cute, charismatic tween with the voice of an angel, and turned him into one of the most successful artists of all time, is already a music industry legend. He was looking for the next Michael Jackson, a prodigy who could sing and dance and write music and mesmerize tens of millions of people. He found 12-year-old Bieber on YouTube and contacted his mother, Pattie Mallette (who gave birth to Bieber when she was 17), and the rest is platinum-record history. Not included in that story is his concern, his desire from the very beginning to make sure Bieber’s life is nothing at all like Jackson’s was. Braun says his own father reminded him that in a very real way, he’d be taking part of this boy’s childhood, exchanging it for fame and fortune. Braun says he made a promise to young Bieber before they started on this adventure that he’d always be in his life, whether Bieber is a musician or not. He committed to a relationship, not just a business deal. He went to college at Emory University in Atlanta and, after a brief venture selling fake IDs, started a business throwing parties. At first they were at a local bar, but soon he was organizing big VIP events: a bash for the NBA All-Star Game, the after-parties on a Britney Spears or Eminem tour. When he was 19, producer Jermaine Dupri hired him for a marketing position at So So Def records, and he dropped out of Emory. When he was 20, Braun was So So Def’s marketing executive director. After starting his own business, he brokered a reported $12 million deal between Ludacris and Pontiac. When he found Bieber in 2008, he worked to build up his YouTube following and then signed him to a “360 deal” on Usher’s record label, Island Def Jam—meaning the label got a cut of all revenues, from ticket sales to merchandise. The label also split the profits with a company Braun formed with Usher and promised to pay for Bieber’s tutoring. Bieber has said in numerous interviews that Braun is “like a close uncle” to him. Mallette has said Braun is like a brother to her. Braun talks about the ups and downs of the relationship—screaming, crying, seeing the world together—and defends the pop star as if he’s family. He also stresses that Bieber’s finances are secured for generations to come, and that there are safeguards in place to help avoid a lot of the disasters of child stars of the past. Bieber has often noted in interviews how stern Braun can be. From there, Braun grew his client list. And since his story is so intertwined with Bieber’s, and Bieber is one of the most famous people on the planet, Braun has himself become a celebrity, especially recognizable to a certain subset of pop-music fans. For years Braun would walk around before Bieber shows and find a small group of kids (usually young, ready-to-scream-into-the-camera girls) who either didn’t have tickets or had terrible seats, and Braun would surprise them with reserved spots in the front row. His impressive ear for talent is a gift, he says, but it’s more about looking for a way to “fill a void in the market.” He says he has everyman-type tastes, so he figures if he likes something, millions and millions of others might, too. And Braun also has a glib, almost poetic way of seeing his relationships with his clients. He says he loves them, and that mentors of his have told him he’s too close to them. But he says he accepts the fact that they will—here’s where he drops one of those F-bombs—him over one day. He knows it’s possible anyone could sign with a different manager at any moment. The night before the Manchester benefit concert, there was a terrorist attack on the other side of the country, in London. There were some concerns the concert might get canceled by organizers or by the police. Braun says Chris Martin called him after news of the London attack broke. “Before I could even get a word out, he said, ‘Please tell me you’re not canceling. Because it’s more important than ever.’ ” He says Marcus Mumford sent him a text saying the same thing. The evening of the concert was overcast and gray. Around 50,000 people were in the stadium. It was also broadcast to more than 50 countries around the world, and streamed live on Twitter, Facebook and YouTube. More than 22 million people watched at least some part of the concert on the BBC, making it the U.K.’s most-watched program of the year. Each artist performed short sets and they all seemed to go off without any issue. Braun walked onstage with the show’s other producers before Grande performed. He wore a hoodie and a ball cap and read from notes on his phone. 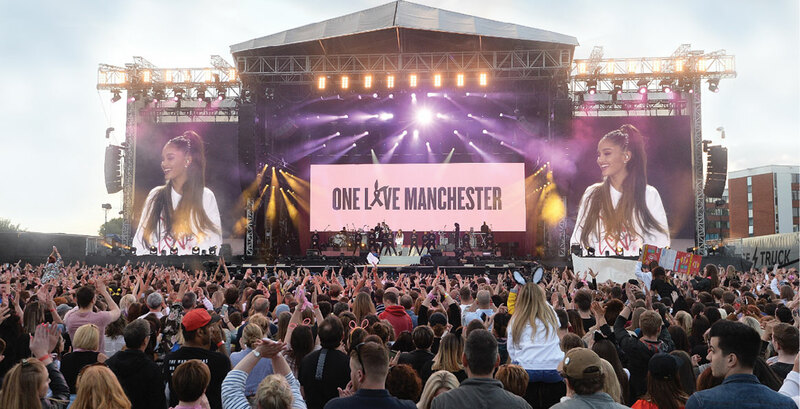 On behalf of Grande and all of the show organizers, he thanked Live Nation, the city of Manchester, the British Red Cross, the BBC and all of the musicians who’d traveled on short notice to be there. He thanked the first responders and the bystanders who risked their lives to save others. And he repeatedly thanked the crowd for showing up. Then he looked up from his phone and out at the sea of people all waving signs and getting emotional. He explained that he’d gone to the children’s hospital with Grande recently, and that there was a TV set up there so the injured kids could watch the show. He said one little boy asked him to remind the world that “love spreads.” He told the crowd that their bravery provided hope for everyone else worried about the next terrorist attack. Then he introduced Grande, and the roar of the crowd was deafening. As he talks about it now, he purses his lips. He thinks about the kids who were still wearing cat ears—something Grande did for years—when the bomb went off. He can still remember meeting with the husband of a woman who was killed picking up their child from the original show. “We needed to take a stand,” Braun says. It was a 3-hour-20-minute concert, but it was also a message. It was pop music as a force against violence, a call for unity in opposition to blind hate. Entertainment as a way to heal, as a way to improve the world. With the power to move people to tears. If you think about it in those terms, some sort of jump into politics suddenly seems a little more reasonable. He says he’s thought about it since the November 2016 election, and even more after Manchester. It was apparent when he strung together the smashingly successfuly Hand in Hand telethon for hurricane relief in September. He’s long wrestled with the idea of stepping forward, of taking any kind of public leadership role, because he worried it would be an arrogant thing to do. He says the more the country changes—“the country that my family sacrificed to come to”—and the more frustrated he gets with the direction of things, the more he thinks about it. He’s not sure what kind of role he wants to play; whether he wants to manage a campaign, or run for office himself, or start a new political party. Imagine the power (and danger), if you could make a politician as popular as Justin Bieber. Braun also says he isn’t sure whether he wants to put his family through that. As he’s talking about it, he stops. He has an analogy that sums up where he’s at in life. He says he loves Italian food, that it’s his favorite. He knows this Italian-restaurant-fight metaphor is a work in progress, but Braun’s arrived at the point. He’d like to talk more about politics and leadership and where his life might be going. But because he’s Scooter Braun, his people were able to secure that last-minute doctor’s appointment to have that tattoo looked at, and now he’s got to go.